The term "Muskoka Five" was tossed around hockey message boards and used by the media in reference to the five Toronto Maple Leafs with no trade clauses: Mats Sundin, Bryan McCabe, Pavel Kubina, Darcy Tucker, and Tomas Kaberle. There are many interesting story lines associated with the name Muskoka Five - where did it come from, what did it mean, and what to do with the players. For the name, we've read that former Leaf, Tie Domi, was the one responsible for the name. Toronto Sports Media wrote that Tucker knew who gave the the name Muskoka Five, and that he said it with a great deal of negativity when asked about the creator. Why would Domi say that about his friends? Who knows if he even did? 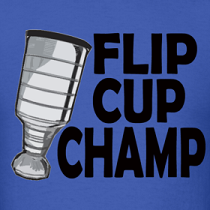 Others have said it was coined after Darcy Tucker had a cribs-esque tour of his house for TV. Not sure if this is the clip in reference, but it does show Darcy Tucker with a nice spread - including a 600+ bottle wine cellar. Also, how hard is that host flirting with Darcy at the end of the video? "We'll hang out, and you can just go now" - she knows he has a wife and three kids! As for the meaning, the interpretation is in the eye of the beholder. Some say it can be attributed to Cliff Fletcher who apparently said the atmosphere in Toronto was too comfortable within the organization and they needed to shake the core up. This "Country Club Atmosphere" could refer to getting too comfortable with losing, or that the players were lazy and would rather be up at the cottage in May/June than grinding it out in the playoffs. We also read that Bill Watters had said on AM640 that the term was in reference to a problem group on the Leafs. Based on the performance of the players involved in the M-5, I don't think they were lazy or accustomed to losing as they competed every game for the blue and white in our minds. Thus, Watters could be right, maybe they were trouble in the organization? But that is something we have no idea about. Whatever the case, the five players in the "Muskoka Five" were only exercising their contractual rights, so you can't hold that against them for not wanting to waive their no trade clauses. You can blame the management behind the contracts, John Ferguson Jr., but that is too easy. The first four departed players of the Muskoka Five brought back no assets to show for. Traded away for bum players or bought out, the Leafs received no young players, prospects, or picks in return. It was essential that if Toronto moved Kaberle, they got something for him. With Kaberle now a Boston Bruin, and a prospect and 1st round pick in the Leafs organization, the Muskoka Five are no more. I dont think Domi would have said that. Wasn't it Bill Watters who first said it? No way , hockey players aren't cheaters haha. 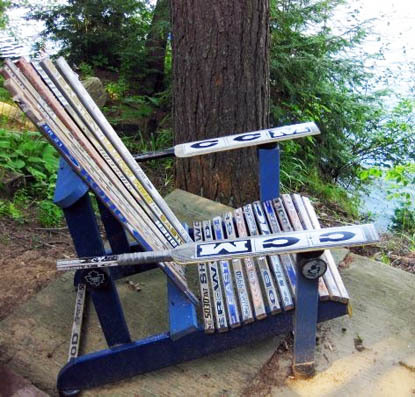 Outdoor Luke made a really good muskoka chair out of our old broken twigs, looks great at our cottage!